Sometimes apostasy feels like just a step away, doesn’t it? While we rejoice to sing He Will Hold Me Fast on a given Sunday, from our limited human perspective, we don’t always “feel” like we are secure. In those moments, the incomplete picture of reality with which we are blessed to enjoy on earth can seem more like a liability than an asset. Our faith feels weak and incompetent, the truth doesn’t appear to be so “truthful,” and doubt begins to solidify in our minds. Perhaps your circumstances and your perceptions of reality right now are causing you to question the nearness of God, his care for you, or his goodness. Or maybe as you view the apparent ease with which your unsaved friends and family enjoy life, you find yourself covetous, bitter, resentful. And your footing seems a little slippery; your stability appears to be lacking. Asaph can identify. Psalm 73 is the memoir of a man who has been to the edge of shipwreck in his own life (c.f. v. 2), when God steps in (via the means he had instituted at that time for communion with himself, v. 17) to bring that man to a place of stability and strength. Following that, Asaph can make some of the most breathtaking and sweeping statements of wholehearted devotion to God in the entirety of God’s Word (v. 24-26). But why? What had changed? Only this: God brought Asaph to an understanding of the extraordinary value and the underestimated worth of a relationship with God. This wholehearted dependence was possible because Asaph had come to treasure God more than the benefits of life that the wicked were enjoying (vs. 4-15). Asaph had come to an understanding that the person of God himself, and a relationship with him as a person, was indispensable to understanding the very purpose of life. And because of that understanding, he had grown to the point of treasuring God above everything and everyone else. Do you remember his statements? Brothers and sisters, in comparison, our desires are far, far too small. A retirement fund that is growing; enough vacation time to satisfy the travel bug, finances to make the trip memorable happen; health to enjoy life with loved ones; healing for the removal of sickness and pain; a job change for the ease of life it would bring; the removal of stressful situations in your life — desires like these may not be all wrong, but they are far too small. God’s design and will includes cultivating within you the heart attitude that recognizes the need for your continued growth in your relationship with God (v. 28a), but simultaneously the honesty to say that your fundamental, bedrock desire is not for God’s benefits and gifts, but for God himself. Are you treasuring God as a person? “There is nothing upon earth I desire besides thee.” What is it that keeps your heart from exulting in response to those words? What desire is it that keeps you from shouting “Amen!” when that reality is uttered? But do you see in the passage what is true if this heart attitude does exist? See the reality if an individual can say, “You, O God, and you alone are what I need right now and always, and you are what I desire!” The reality is in verse 26: “My flesh and my heart may fail, but God is the strength of my heart and my portion forever.” When God becomes the all-consuming desire of our lives, while our inner man (our heart) and our outer man (our flesh) may fail, we remain secure. If you make God your treasure, your emotions may fall apart in the middle of a crises, your courage may leave you when you get that dreaded diagnosis, your intellect may fail to comprehend what it needs to in any given moment of a trial, and your body may revolt or shut down in the storms of life. But God is the strength of your heart. The believing man’s or woman’s strength is not dependent upon the alteration of circumstances, but rather upon an alteration of that individual’s treasure. And what is God’s response to this change of perspective, this shift in what one treasures? What is God’s response when we desire God himself above everything else? Inner-man strength, yes, but it goes far beyond that. “[God]… is my portion forever.” God gives himself. When we see God for who he truly is, we will desire him and nothing and no one else. And God gives us the desire of our hearts. He gives us Himself. What are you looking for to make life work? What is the “only thing” standing between you and true happiness? What do you sacrifice time and money and energy for? Questions like these may help to answer where your treasure is. So you have one of your treasures in mind? Let’s hold it up to Scripture. Does it make this statement true or false? ________[fill in the blank]_______ is the strength of my heart and my portion forever. Brother and sister, if you mentally inserted anything or anyone else other than God in the blank, your desires are far too small. You have exchanged the glory of God for a created thing. You are in the throes of idolatry. Take a moment to confess your idolatry to God; take time to reevaluate your life honestly before him. Take a moment to reorient your treasure. Tell God that you desire to want him above everything and everyone else. Life is too short, eternity is too long, and God is too glorious to live a moment longer without him as our inestimably valuable, all-encompassing, all-satisfying treasure.  Father in heaven, exalt your name among the nations and exalt your name among the brothers and sisters at Lakewood Baptist Church. Forgive us for our collective and individual idolatry; it is a gross sin in your eyes. Forgive us for being deceived and for deceiving ourselves into thinking anything can replace you in value and worth. Father, because of Jesus, grant us grace to say that you are all we have in heaven; that we desire nothing upon earth besides you; that while our heart and flesh will fail multiple times today, that you are the strength of our heart. Father, we long for the day when you will be our genuine portion forever. May that day come quickly. Until then, may we treasure you for who you are, not for what we may get from you. In the name of Jesus, Amen.